As part of the celebrations of 30 years of The Young Theatre at Beaconsfield, the group presented this production consisting of three one-act plays ... "Oedecles - King of Thebes" ; "Easy Stages" & "Melons at the Parsonage" ..pastiching over 2000 years of theatre. 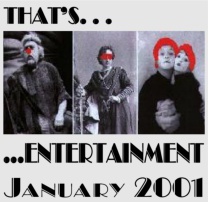 Performed at the Curzon Centre on January 4th; 5th & 6th 2001 it was the first production of the 2000/2001 Season and the first under the supervision of Mark Oldknow as the group's new Artistic Director. The triple bill was selected as a means of providing training, but also of providing opportunities for the membership to extend their experience both on and off stage. An intention that proved to be highly sucessful on both counts.